The Los Angeles Business Journal (LABJ) tracks the top firms located in the Los Angeles area. We examined the shares of women on top corporate boards in Los Angeles during June 2004, February 2010 and just updated that research with the 198 top Los Angeles area firms as of October 2010. Overall, shares of women director seats rose from 7% in June 2004 to 8.3% at the beginning of 2010 and then 8.2% by the end of 2010. Comparable figures for Northern California are closer to 18%, while the national percentage for top Fortune 500 firms is about 15%. Twenty-three of the LABJ top 198 firms were large enough to be included in the Fortune 1000 rankings. Those firms had an average of 14.9% of their director seats held by women: 36 women directors out of a total of 242 F1000 board seats. The 175 smaller firms averaged only 6.8% women directors. Among major US cities, Los Angeles has one of the lowest shares of women directors at their top corporate boards. This report examines some possible causes. Major explanatory factors include the industry profile of companies in the city as well as the high turnover among Los Angeles firms. Highlighting a pattern we keep seeing around the globe, the total number of directors at top LA firms continues to decline. 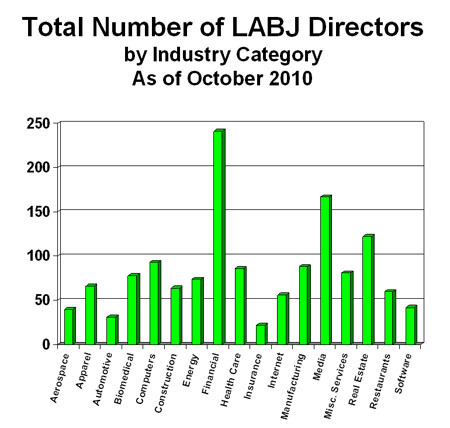 There were 1,490 total director seats at LABJ firms in 2004; by October 2010, there were 1,412 -- a net loss of 88 seats. Women added 12 net seats during this period although there were four more women directors in February. 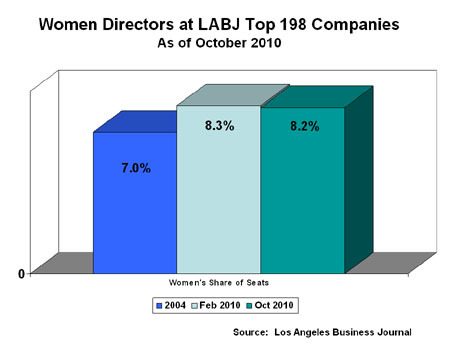 By October 2010, the 198 LABJ firms had 116 women-held seats. Four women held two board seats each: Christine A. Garvey, Julia A. Stewart, Dr. Andrea L. Rich and Jennifer Holden Dunbar. 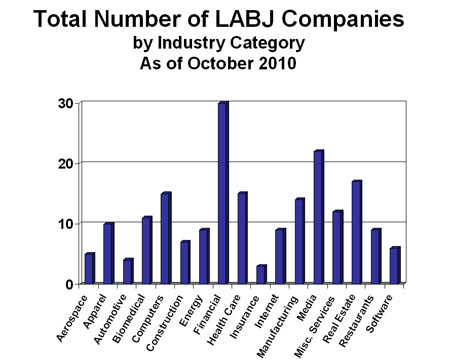 In the two charts below, the total number of LABJ companies and directors are presented by industry sector. The two tend to mirror each other, with a strong LA buisness presence in Financial Services firms (30), Media/Entertainment/Leisure (22), Real Estate (17), Computers and Health Care (both 15). 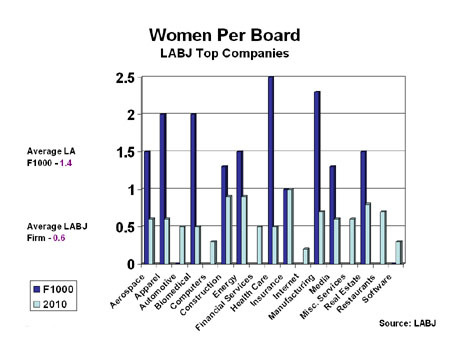 Women directors among LABJ top firms, as shown in the chart below, concentrate in different industry sectors: Insurance, Manufacturing, Energy/Utilities and Real Estate. Unlike companies, the industry sectors Finance and Media have lower average shares of women directors. Fortune 1000 firms are more likely to have more women per board, but there are few companies of that size remaining in LA. There are 5 women directors at 2 F1000 companies in Health Care; 7 women at 3 Manufacturing companies, 2 women at 1 Apparel company and 2 women at 1 Biomedical company. 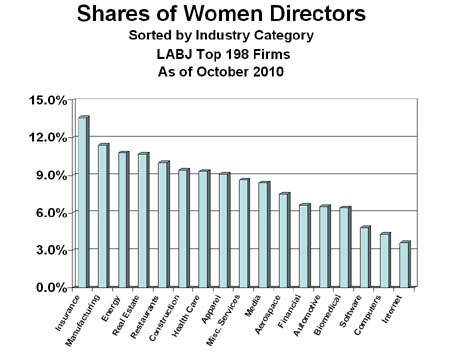 The high turnover of firms in the LA market is another factor explaining low shares of women directors. 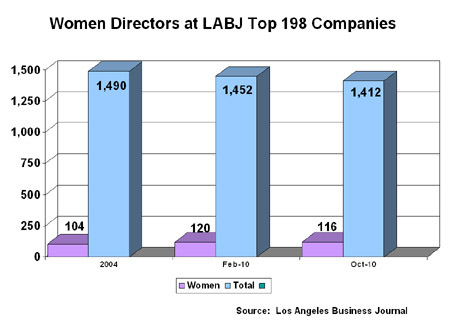 Sixteen firms fell off the LABJ list between February and October 2010 representing a loss of 13 women directors out of 125 (10.4%). Southwest Water, with 3 women directors, went private. CKE Restaurants, with 1 woman director, was acquired. Three financial firms folded, were acquired, or left the list, removing 3 woman directors. 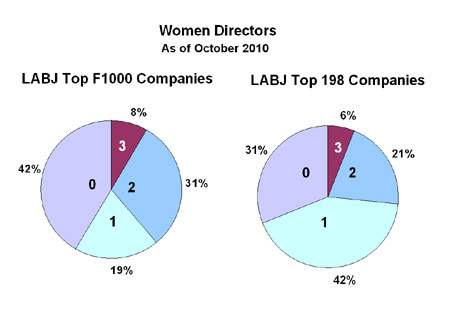 The concentration of women directors among top Fortune 1000 firms in the LABJ listing is highest for Energy, Apparel and Health Care, as indicated in the chart below. 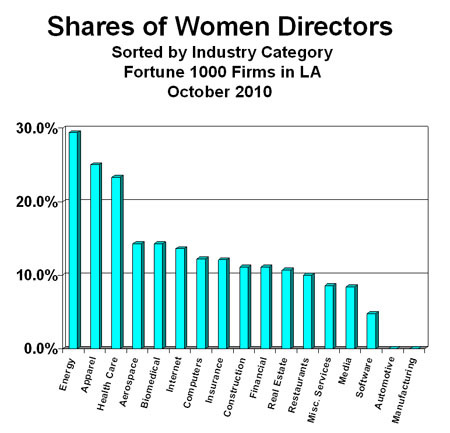 The overwhelming majority of firms in Los Angeles have zero, 1 or 2 women directors per board. Forty-nine firms have 1 woman director. Twenty-four firms have 2, and seven firms have 3 women directors. Thirty-six firms have zero women directors. Six women directors resigned between February and October (one of whom moved up to a CFO position at the same company). Sixteen new companies were added to the list, but only 1 new woman director came with them. Typically, new firms are smaller and are less likely to have women directors in the early formation stage. Fourteen women directors were added at existing companies on the LABJ list. Only one F1000 firm added a new woman director; two top firms experienced a decline of one woman director each. We would expect the Los Angeles market to be an enlighted, liberal metropolitan area with a great deal of diverse talent from which corporate boards could choose. Yet, we hear anecdotal evidence from area business schools which offer Director Training programs that they have a difficult time persuading women in the Los Angeles marketplace to attend. At Southern California NACD events, typically a 50 person event will have somewhere around 5 women professionals in attendance. Other programs geared to women director candidates have difficulty generating interest unless a tea or wine-tasting is included. At a recent speaking engagement, we asked the women professionals in attendance to describe their "board experience." Each woman mentioned two or three non-profit or charity boards on which they serve. Perhaps the Los Angeles marketplace for women directors is more focused on those sectors rather than the for-profit business boards. That would describe "personal choice" as a determining factor on the supply side, rather than bias or discrimination on the demand side, for women corporate directors. After studying women on corporate boards in California since 2004, it's still surprising to me that I recognized only about a third (36) of the 111 names listed. However, that is about 35 more than most people recognize. The next stage in this research is to learn more about the other two-thirds.